This month it was my turn to pick the ingredient for the Monthly Ingredient Challenge, and my choice was 100% based on this soup. I picked coconut, since the soup has coconut milk, and I knew it would be an easy ingredient to source for everyone; galangal and lemongrass aren’t always so simple. 😉 But this is the Godfather’s favorite Thai soup, his metric for all Thai restaurants we visit, and so worth making, even if it is 100 degrees outside. 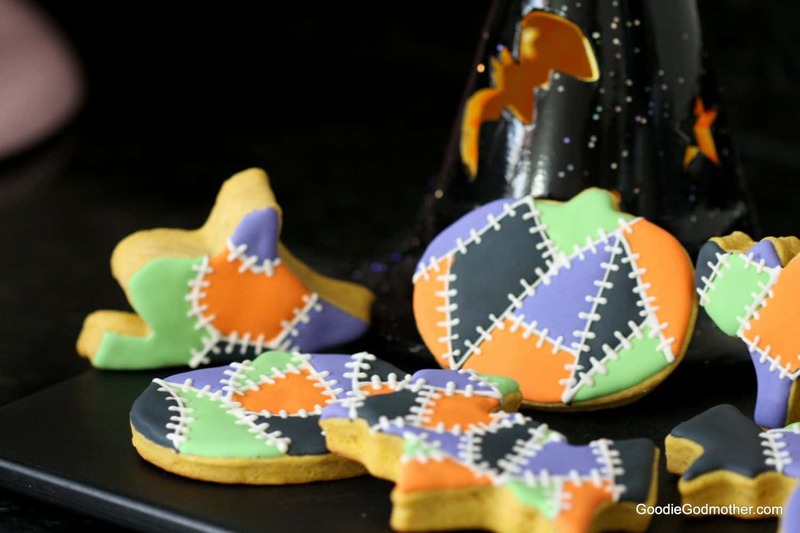 Goodie Godmother – your recipe blog for seasonably inappropriate recipes. And today, we do not care. 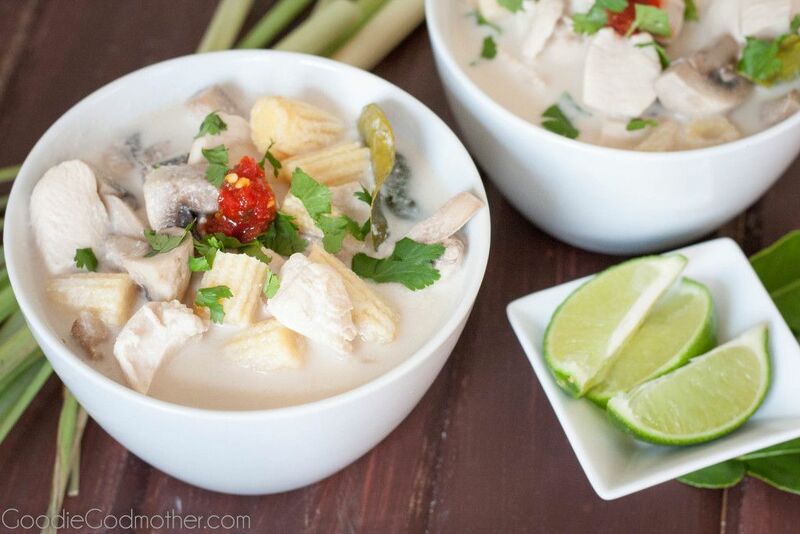 Tom kha gai (also spelled thom kah gai or tom ka gai) soup is a Thai soup with coconut, lemongrass, Thai ginger (galangal), chilis, lime, and some sort of protein, usually chicken. It’s a little sweet, very savory, a touch spicy, all the things one needs for a true umami experience. I was so set on making this a slow cooker recipe. My mother had this soup for the first time with us on a trip through Las Vegas, which included a stop at Lotus of Siam, and she LOVED it. My mother wanted to know how to make it, but my mother does not cook. If it takes more than 10 minutes, it’s too complicated. So I wanted to tell her, and you, that this soup, with all its layers of flavors, is as easy as “set it and forget it”, but it’s not, and it can’t be because of the coconut milk. Coconut milk doesn’t hold up well to low and slow cooking without a starch or something to absorb it, and it will separate and look rather unappetizing, and we don’t want this. BUT, I have a compromise! The broth is actually very easy to make, and it does freeze well, so I propose that when you do take the 20 minutes to make it, you simply double the batch, freeze half for later, and go about your happy soup making way. 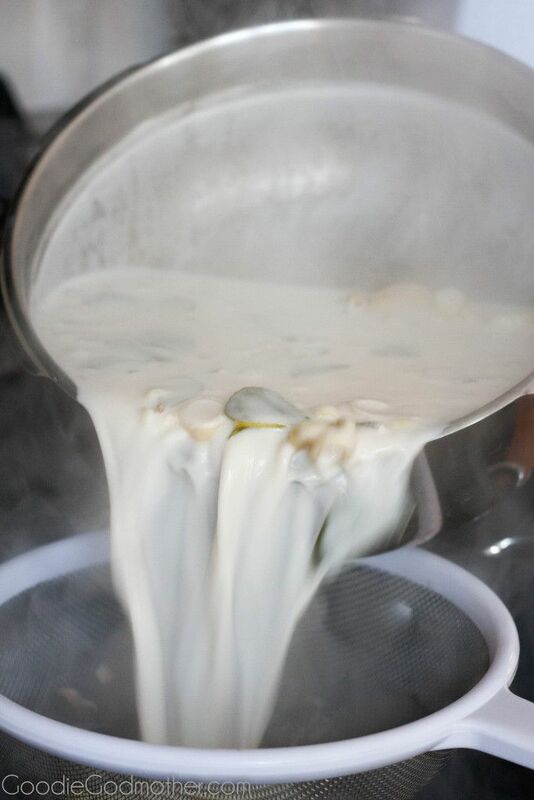 Thaw the frozen stock and you have a fresh batch of tom kha gai soup in minutes with minimal effort. Oh, and it probably tastes even better than the first time around because the flavors have had time to get to know each other. Like I said earlier, this soup is my husband’s absolute favorite Thai soup, and I had to get the flavors just the way he liked them. We were so fortunate to visit many really good Thai restaurants that make this dish in a traditional style, so I wanted to come as close to that as possible. My recipe ended up being a modification from this one on Small Footprint Family, and one out of this Thai cookbook by Judy Bastyra. We tried both recipes, and neither quite had the flavors L (The Godfather), remembered from the Thai restaurants, so I created my own modified version that he loves! Let’s start by talking about ingredients, because this is one of those recipes where the more authentic your ingredients, the more authentic your soup. I’d recommend a trip to the local Asian market to source some of the items, but I have seen more Asian produce working its way into traditional supermarkets, so you may be in luck depending on your area. The first really important ingredient to look for is fresh lemongrass. I’ve used the jarred in a pinch, but fresh is best if you can find it. The second, and probably the most important, is galangal, or Thai ginger. Galangal, like ginger, is a root, and it looks very similar to ginger, but it isn’t. The flavor is distinct and you can read more about the differences here if you’re curious.. 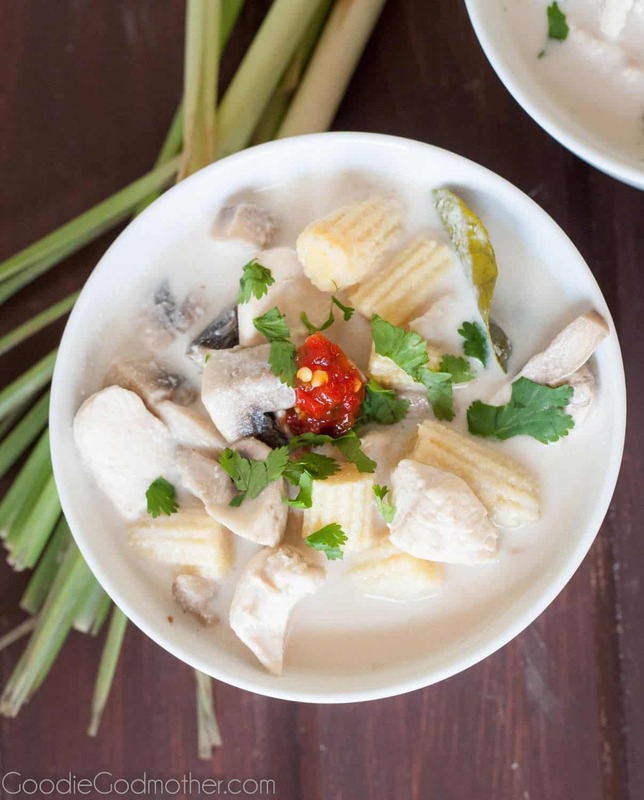 This soup is called tom kha gai… the kha meaning galangal, so you really need to try and find fresh galangal for an authentic flavor. If you really can’t, you may substitute ginger, but I really really really really really really really encourage you to look for the galangal. It’s not too hard to find, promise. 🙂 The third ingredient that might be unfamiliar are the kaffir lime leaves. I find them fresh in the produce section of my local Asian market, and I’ve heard they freeze well too, although I haven’t tried. And finally, chilis. You want to look for the small bird’s eye or Thai chilies. They are really spicy though, and if you have people in your family who prefer different levels of spice, I would recommend purchasing Thai chili paste instead. Since we have a toddler, I opted to go the chili paste route so my husband and I could add spice to our liking later. Keep in mind that chili paste is different than the sweet spicy chili sauce. Chili paste is a deep red and sold in smaller jars. Now that you’ve sourced the ingredients, making the soup is easy! You start by making your broth, simmering together the lemongrass, garlic, chilies, galangal, lime leaves, and other spices for a few minutes to bring the flavors together. Then you strain the broth using a mesh sieve to remove the solids, add your vegetables and protein, simmer, and serve! 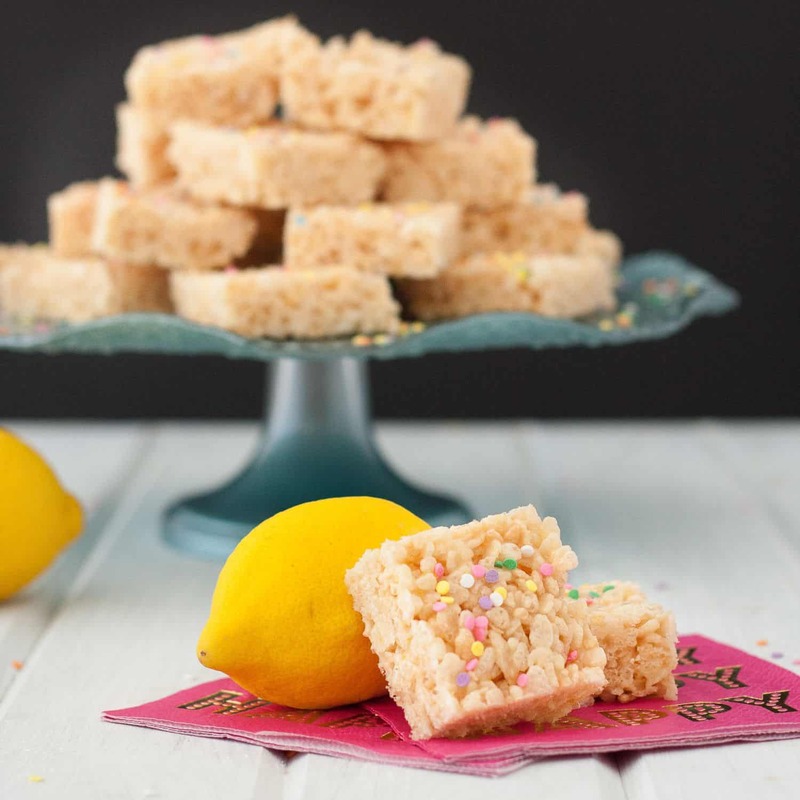 Be sure to scroll past the recipe to check out the other fabulous coconut inspired dishes! 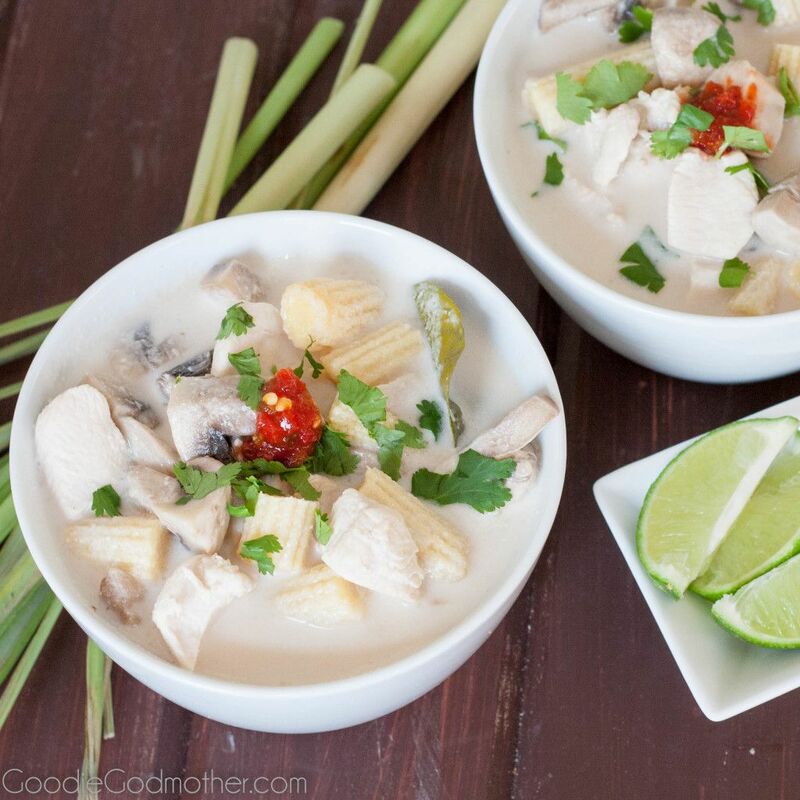 Lemongrass, galangal, coconut milk, and chicken make a comforting and healthy classic Thai soup! Slice the white portion, and about an inch or so of the green portion, of the lemongrass into rounds. Place in a large stock pot. Tear in 5 lime leaves, the peppercorns, and your chilies (if using). Peel the galangal and slice into thin rounds. Add to the stock pot along with your coconut milk and chicken broth. 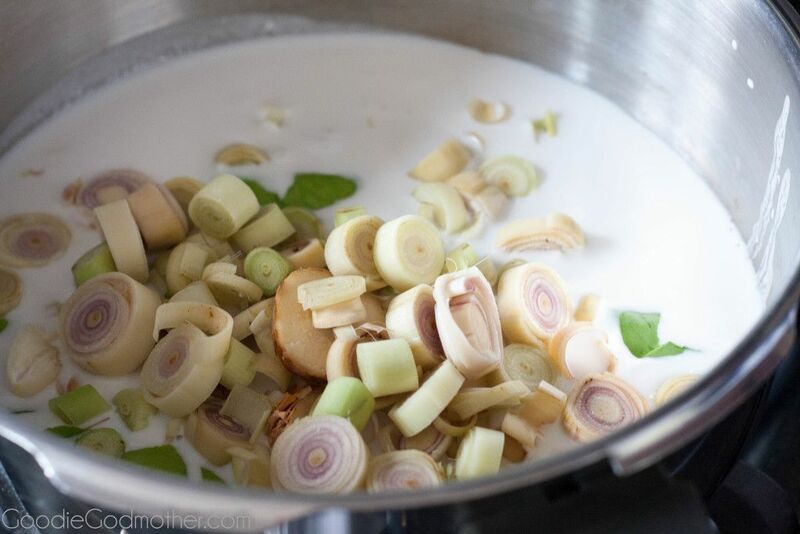 Bring the soup broth to a boil and then immediately reduce the heat to medium low and simmer gently for 10 minutes. Strain the broth into a new pan to remove the solids. If you doubled the broth to freeze some for later, separate what you'd like to freeze now. Place the soup back on the burner over medium low heat and add the mushrooms, baby corn, remaining lime leaves (tear before adding), and chicken. Cook 7-10 minutes until chicken is cooked through. Stir in the fresh lime juice and fish sauce. 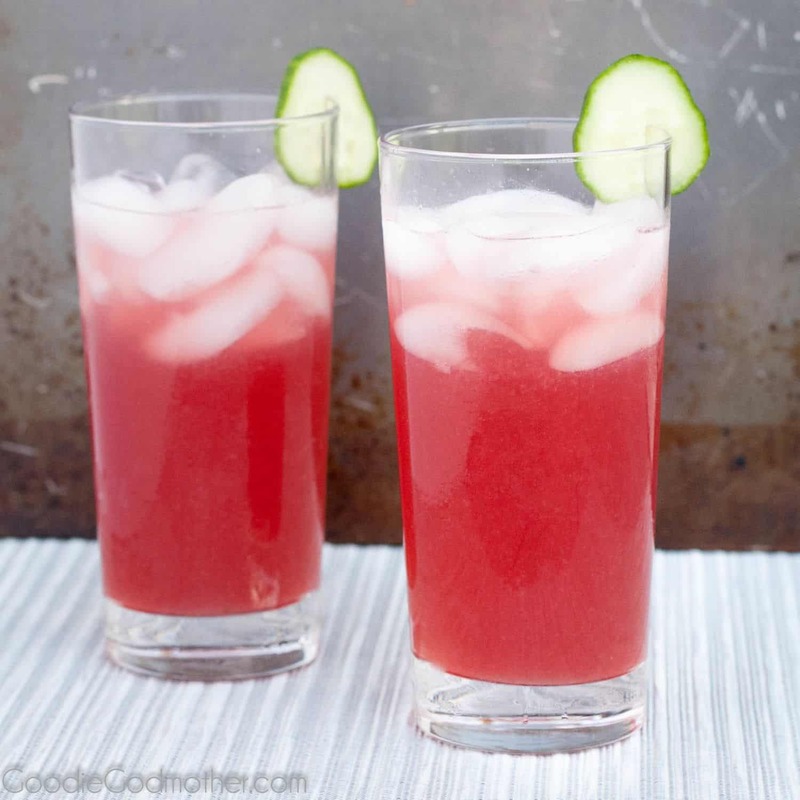 Serve and garnish with a lime wedge, fresh cilantro, and chili paste. I love Thai soups, but I’ve never made any at home before. I might just have to use this as my inspiration to make my first batch of Thai soup right as soup season begins. This is definitely one of my very favorite soups Mary. 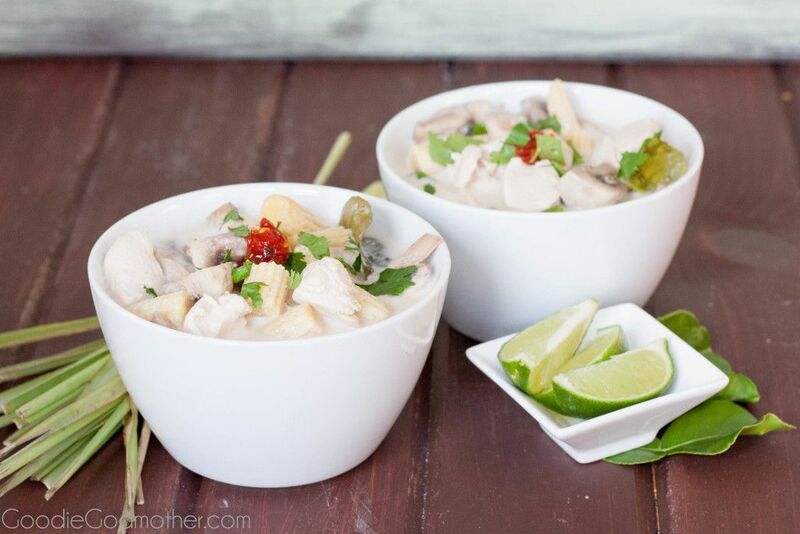 I’ve never tried making it, but I’ve always wanted to – something about the combination of coconut and lemongrass …it’s such a savory, and tropical taste! Can’t wait to try this!!!!! I made your recipe before and it was super easy and tasted every bit as good as my local Thai Restaurant. So my partner has requested I make it for her again so guess what’s for dinner tonight!!! My kind of dish! We LOVE Thai & Asian flavours so def going to make this! This wouldn’t be my favorite since I’m not a coconut fan but all I can’t think about looking at these beautiful photos is…how do you eat those little baby corns? Oh my gosh this soup looks AMAZING! I am going to have to pin it and give it a try! 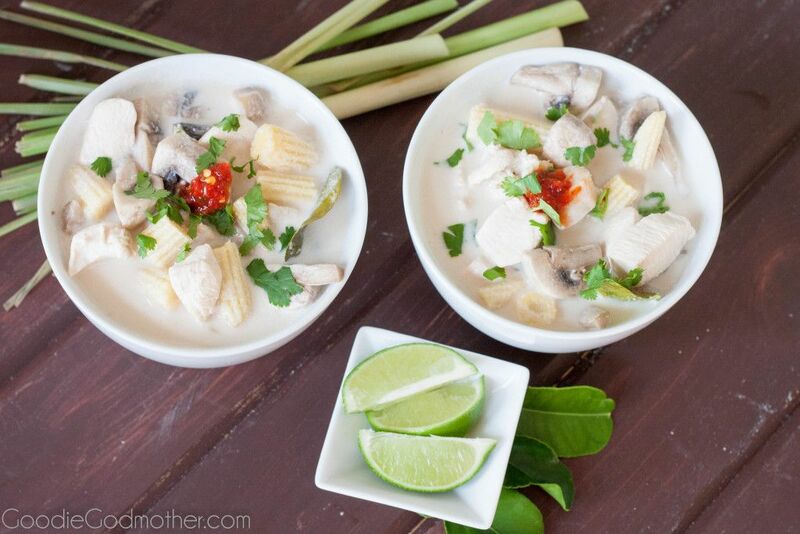 I have never tried any Thai soup, but this one looks amazing!